Matt Hardy officially retired today, but is it really "time to go home"? Well, it had been a long time coming, the rumours were circulating, and we had prepared for the worst with regards to Matt Hardy - but the bad news was finally confirmed today. In a poignant message to the world, a sombre but grateful Matt Hardy spoke from the heart, ditching his Woken gimmick, to address the rumours that he may have wrestled his last match - and, well, it seems he has. The secret was out the bag earlier this week when Hardy reportedly told a fan this week that he'd wrestled his last match, and The Woken One spoke after the Corpus Christi live event to say the time has come and he won't be returning to the ring any time in the near future. 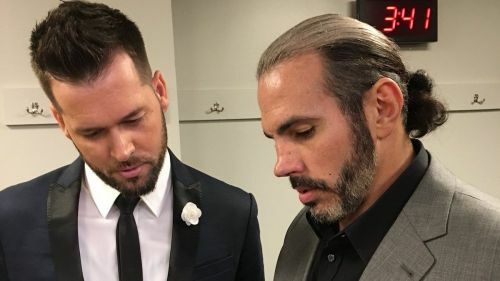 It was first reported weeks ago that Matt Hardy was taking an extensive period of time away from the ring due to an issue which is causing his spine and pelvis to fuse, likely due to years of physical wear and tear - but after his wife, Rebecca, spoke about the injury and photos emerged of Matt backstage in a suit learning the ropes to prepare him for when the inevitable occurred, it seemed like it was all but confirmed. The former TNA World Heavyweight Champion and multi-time WWE Tag Team Champion did say, "Never say never," but an out-of-character Hardy delivered a very heartfelt message, which you can watch below. So, what's next for Matt Hardy? He said, "It's time to go home," but after spending a lifetime in the business, is his home in the wrestling industry? With such a great mind for the business, I look at five roles Matt could transition into to stay in WWE. Well, let's get the obvious one out of the way first. Ever since the news of Hardy's injury emerged, rumours arose that Hardy may be learning the ropes backstage and could very well transition into a producer role - confirmed by the man himself and his wife shortly after. As we've seen with matches that have recently been produced by the likes of Shawn Michaels and Tyson Kidd, a producer role something that would be a no-brainer with Hardy's in-ring experience coupled with the creative streak that saw the "Broken" character birthed. This would be an awesome role for Matt Hardy and, while we might not see much of the man himself on television, everyone would reap the rewards of his unique way of thinking.